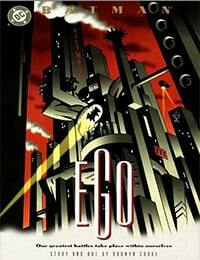 Batman: Ego Average 0.00/5 - out of 0 total votes. Batman blames himself for the slaughter of a family whose father was a henchman of the Joker. Racked with guilt and losing large amounts of blood Batman returns to the Batcave where Bruce Wayne confronts Batman. The two argue about who he really is, what his purpose is, what methods he should be using to put an end to crime and his true motivation for doing so.